In keeping with my pledge to spend more time in nature this year, I made my first visit to the Outdoor Campus – West in Rapid City this past weekend. Run by South Dakota Game, Fish and Parks, the Outdoor Campus — West opened in 2011. 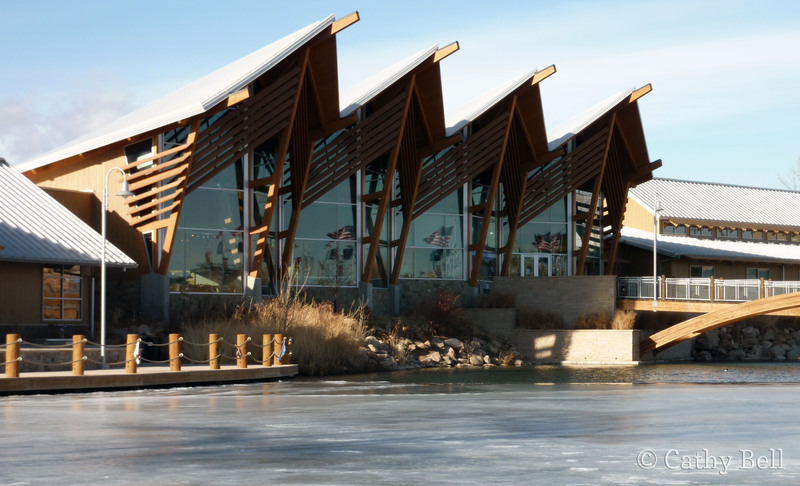 The facility features a LEED Gold building (one of only eight structures in South Dakota that have attained this level of certification from the U.S. Green Building Council) situated on 32 acres that include two small ponds, a stream, and 1.5 miles of trails. The windows lining the front of the Outdoor Campus – West building look out over a pond that’s home to ducks and muskrats. View a map. A footbridge over a pond leads from the pond to the building’s front door. Despite temperatures in the teens and a chilly breeze, I lingered outside on the bridge, looking down at several species of diving and dabbling ducks that paddled about on the unfrozen portion of the pond. There were several gadwalls, lovely ducks that have a sort of understated elegance to them. 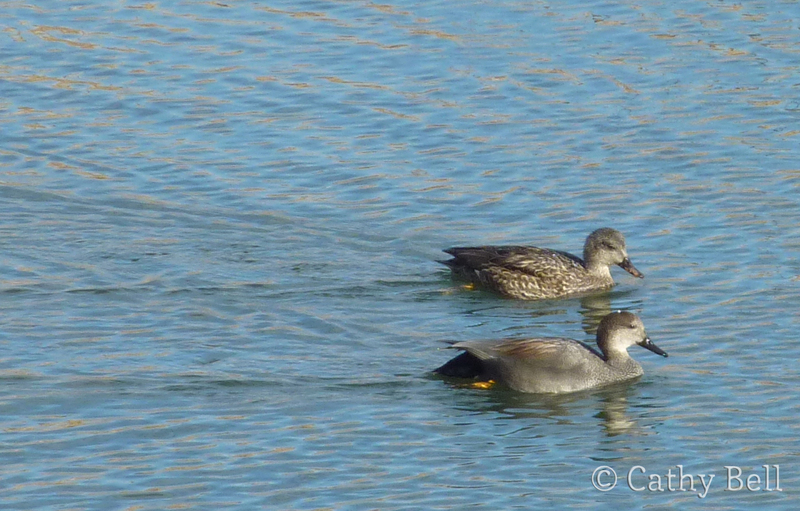 A pair of gadwalls (Anas strepera). The male is in the foreground, the female in the back. 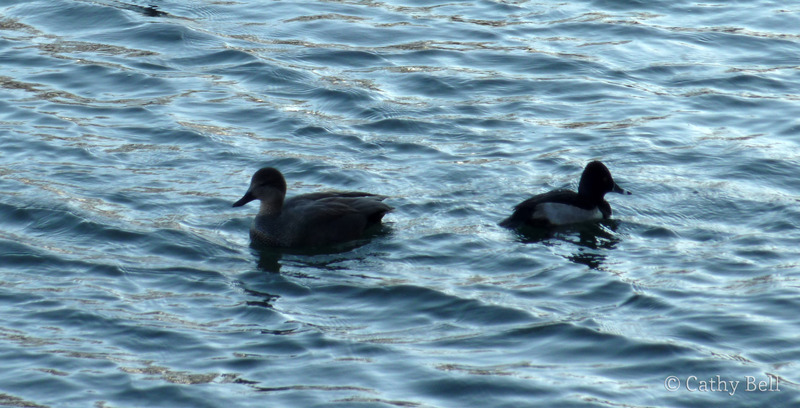 A gadwall (left) and a ring-necked duck, Aythya collaris (right). I always think that ring-necked ducks should be called ring-billed ducks because they have such prominent white markings on their bills. 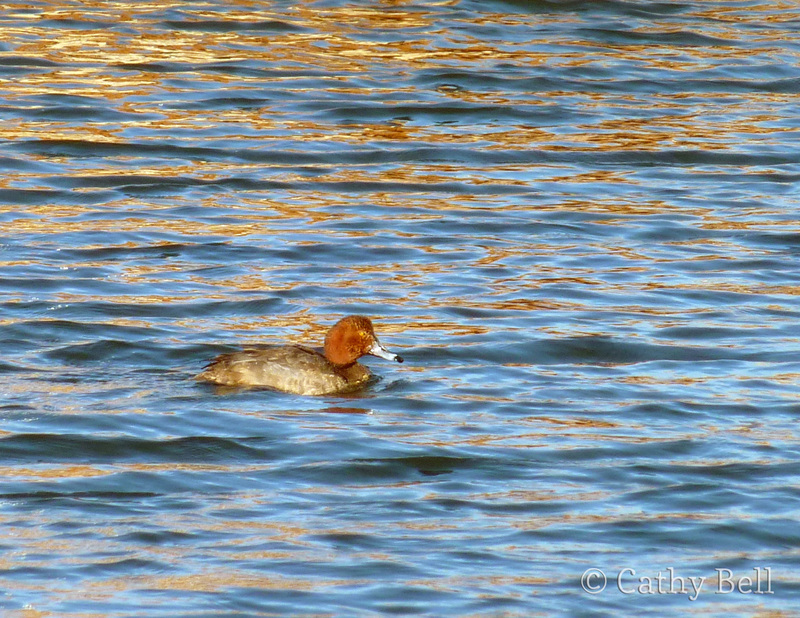 A redhead, Aythya americana, looks similar to a canvasback. The easiest way to tell the two duck species apart, I’ve found, is to look at the bill. A redhead’s is blue with a black tip, whereas a canvasback’s is all black and slopes straight up into the forehead. 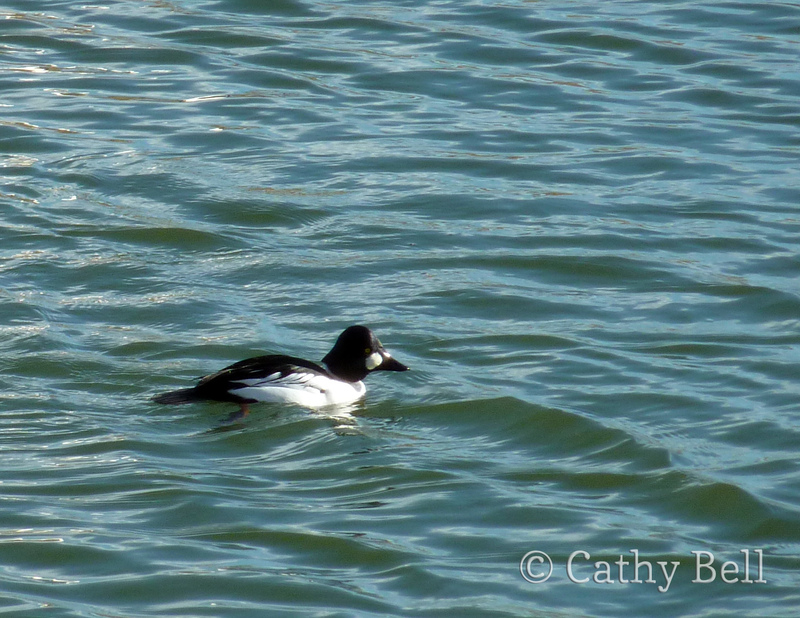 … and a common goldeneye. A common goldeneye, Bucephala clangula, swims in the pond in front of the Outdoor Campus – West. It was fun to see both dabbling ducks (mallard and gadwall) and divers (ring-necked duck, goldeneye, and redhead) in one place. I’m more used to seeing dabblers in shallow ponds, where they can tip up and feed on vegetation, and divers in deep lakes where they swim around in search of fish. It would seem that this little pond in front of the Outdoor Campus has a variety of depths to suit both types of waterfowl. Besides the ducks, I also spotted a muskrat. 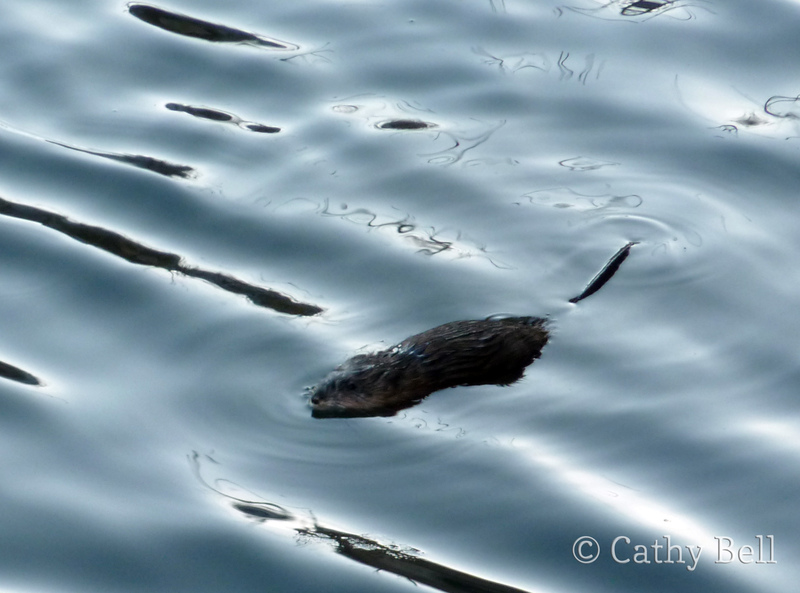 Weighing in at 2-3 pounds, muskrats sport a thick undercoat of fur which traps air. This serves to keep the muskrats warm and dry in the water, while also helping to maintain buoyancy. Though they’re small, muskrats are mighty; they can hold their breath and stay underwater for up to fifteen minutes! 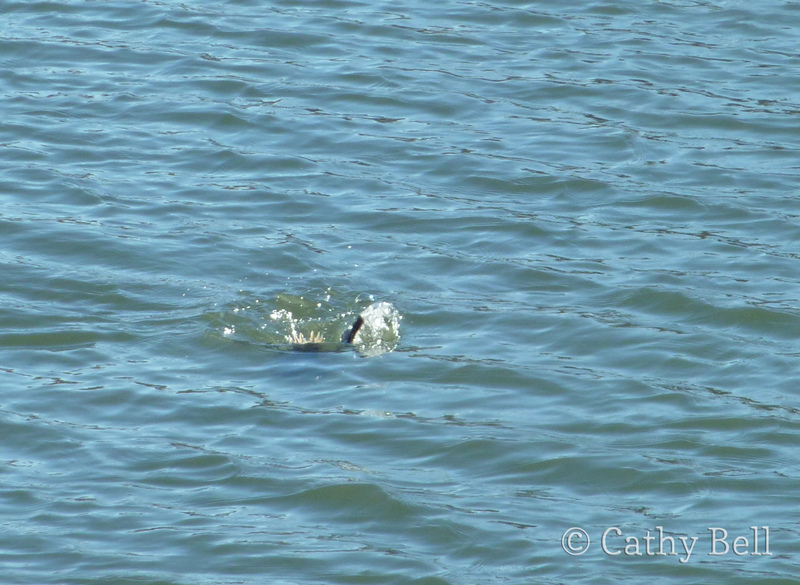 A muskrat swims in very cold waters at the Outdoor Campus – West. All this, and we hadn’t even gone inside yet! Entering the building, we found that it was set up with four loosely-divided zones representing the habitats found in the Black Hills, badlands, prairies, and lakes and streams. Each zone showcased wildlife and natural features that occur in those habitats. There were lots of taxidermied animals. 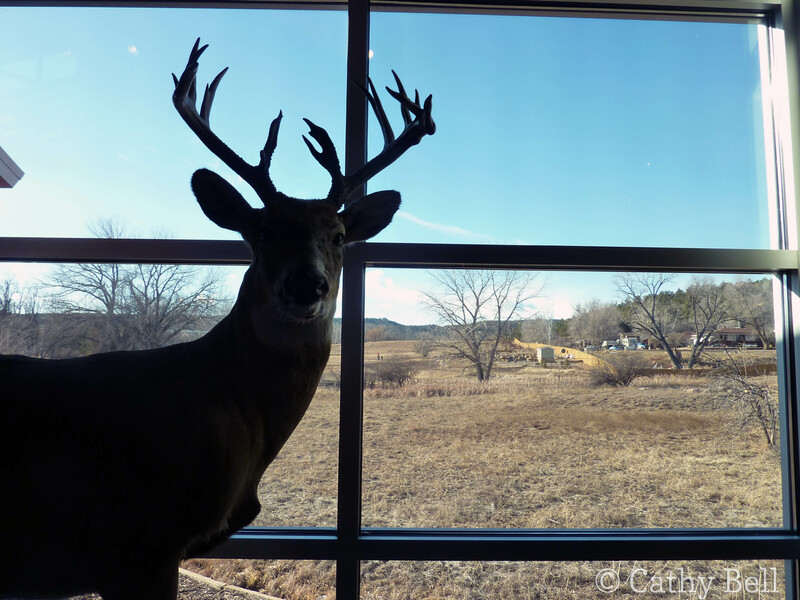 A taxidermied whitetail deer in the Black Hills section, in front of a window overlooking the outdoor part of the Outdoor Campus. The exhibits had a strong tactile emphasis, with a refreshing lack of technological gewgaws. There were lots of pelts and bones and antlers around for picking up and touching. I was a little disappointed by the lack of labels and text on the wildlife displays, but I should mention that I do not seem to fit the target demographic for the facility; the building and its grounds are geared towards families with children. For kids (of all ages), being able to handle objects is an important part of a memorable experience. 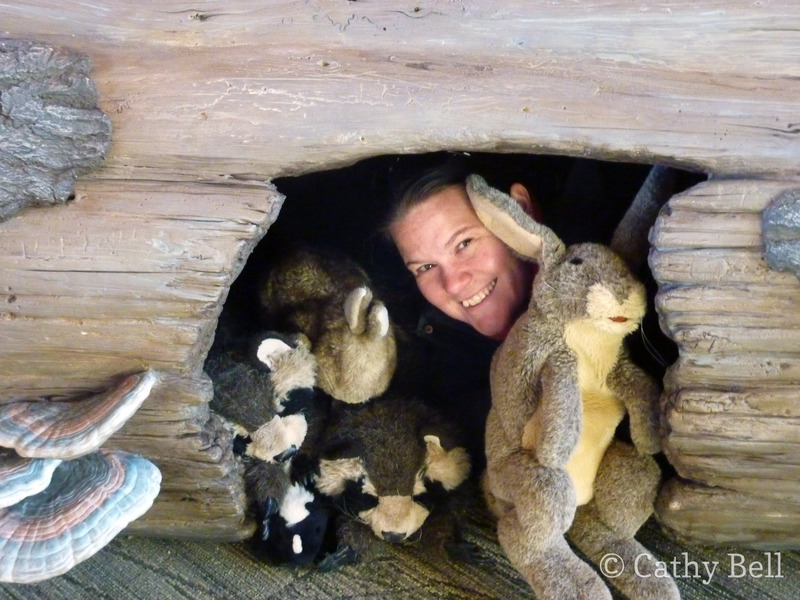 I got into the spirit of things, climbing into a hollow log and hanging out with the puppets that lived there. Not for kids only! Fallen logs are food for decomposers and habitat for animals. And me, apparently. 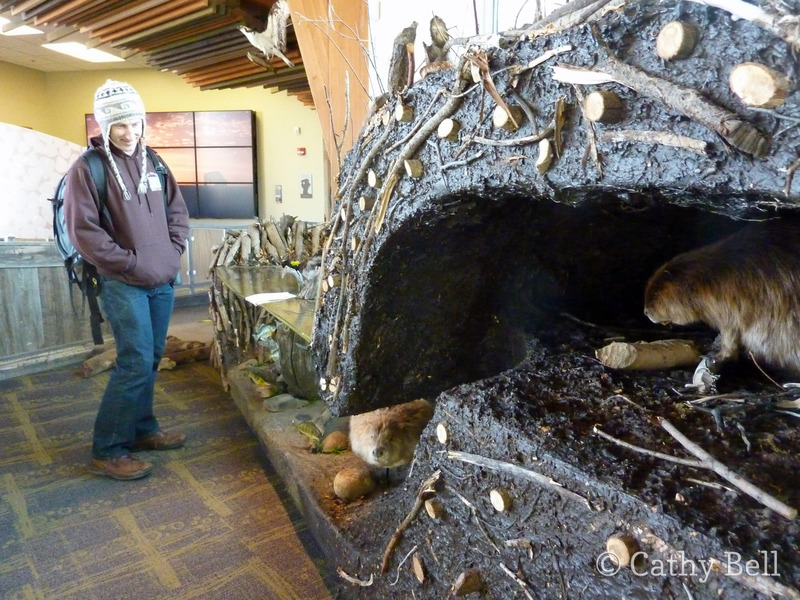 Dave admires a cutaway model of a beaver lodge. We admired fish swimming around in the 4,600 gallon freshwater aquarium, then headed outside for a walk on the trails. Once we’d left the building, we had the grounds pretty much to ourselves. There were lots of kids at the Outdoor Campus that Saturday afternoon, but most of them were inside at a BB Gun Basics workshop. South Dakota Game, Fish and Parks uses the Outdoor Campus – West (and its older, companion facility in Sioux Falls) for classes in archery, snowshoeing, boating, fishing, cooking wild game, and track identification, among other topics. I wish I didn’t live quite so far away from the Outdoor Campus. The class offerings are varied and are geared for a variety of different audiences, including adults with no kids in tow. I’m sure I’ll visit again, though … and if you find yourself in Rapid City, I definitely recommend stopping in for a visit. Wow…Ducks on a lake that isn’t frozen in South Dakota. Looks like a place we should visit. Well, it was half-frozen! … but it’s one of the two good winter duck ponds I know in Rapid. The other is Canyon Lake, where a northern shoveler has been hanging out recently. Canyon Lake is by far the larger of the two, and is the centerpiece of a nice town park. Should you find yourself in SD anytime soon, it’s worth a visit, too. Really a beautiful space! And they have classes — I wish more around here did. They should, with all the snowbirds. Minor events are held, but not many classes per se. But we should be thankful they’re still up and running with all the budget cuts, eh? And… 15 minutes under water for a muskrat? Wow. I’ve never seen one! Hi Cathy! Thanks for your visit and the great write-up. To respond to one of your questions/concerns, the reason we don’t have name signs beside all of the mounts & specimens is because we often use those exhibits and spaces for teaching classes, tours, etc. We often visit with the participants about the habitats, species and such and don’t want to give all of the answers away up front. However, we do offer an ‘Indoor Field Guide’ brochure to all of the specimens at our reception desk. We hope to see you here again sometime! Ah, thank you! That makes a lot of sense. I like the idea of engaging people–especially the kids you have participating in programs–in observing and figuring out what they’re looking at rather than just telling them. I appreciate the response and hope to visit again soon!